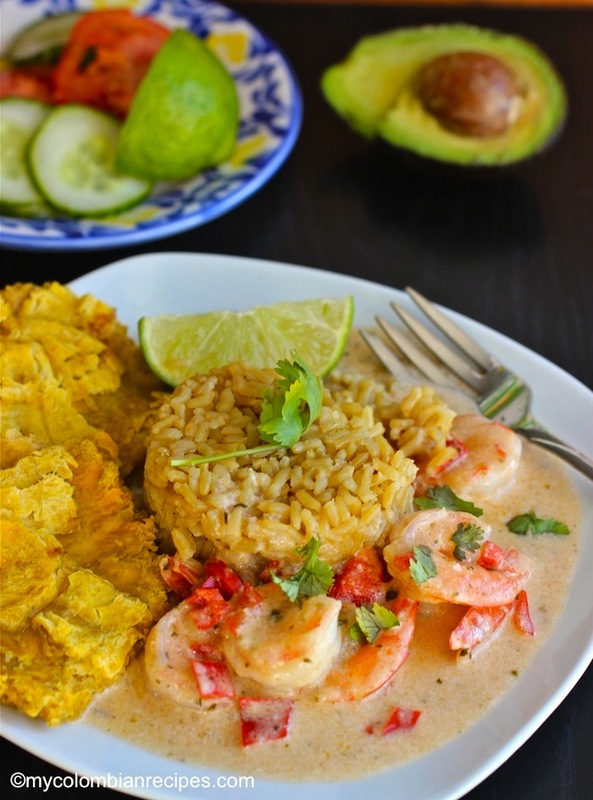 Camarones a la Criolla is a delicious shrimp stew made with coconut milk. 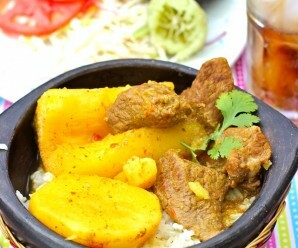 It is simple and quick to prepare, just serve it over coconut rice or white rice. 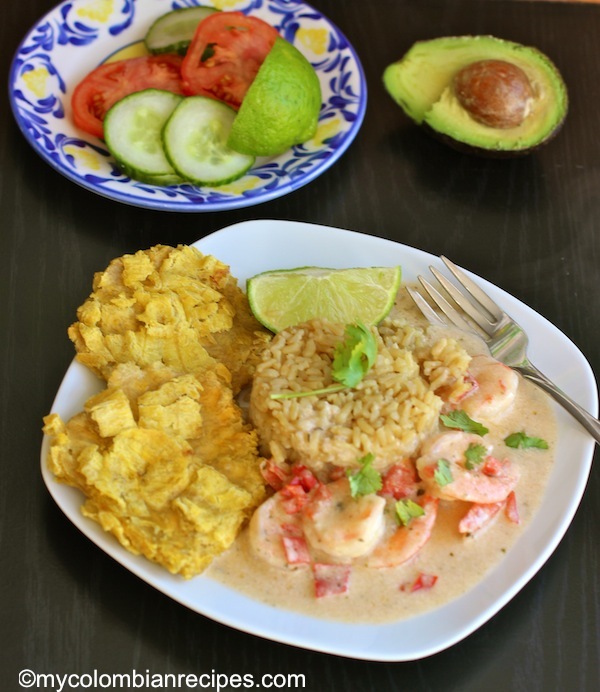 This Colombian classic blends the delicious flavor of coconut milk with the great taste of shrimp. In a large pot, bring water to a boil. Turn off the heat, add the shrimp and cover. 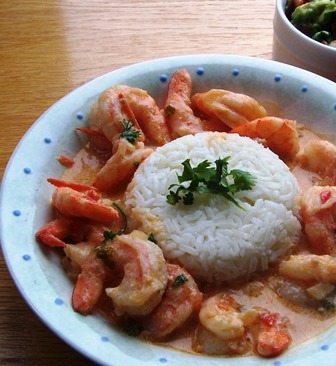 Leave the shrimp in the hot water for 1 minute, drain and set aside. In a large saucepan over medium heat, melt the butter and vegetable oil. Add the onions, tomato, red pepper, garlic, ground cumin, salt and pepper. Cook about 10 minutes, stirring occasionally. Add the coconut milk to the saucepan, bring the sauce to a simmer and then reduce the heat to medium low. Add the shrimp and cook in the sauce for 5 minutes, Remove from the heat and add the chopped parsley and chopped cilantro. Add salt and pepper if necessary and discard bay leaf. Serve each portion in a bowl with rice. Wow — you are batting 1.000 on my “Oh, I want to make this!” meter today! I think my dinner plans (it had been Vietnamese Clay Pot Pork) just took a hard left turn and I will be shopping for shrimp today! Thanks to this post I do not look like an idiot. I had an argument with someone and this shows I was right. Thanks! Thank you so much. I made this dish yesterday and my friends loved it. It was absolutely delicious. 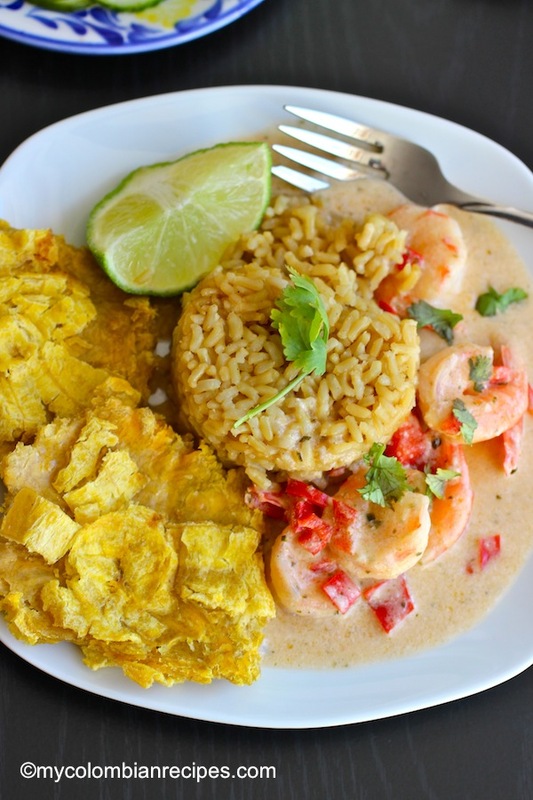 I followed all the steps and it was perfect with white rice on the side. This was an awesome recipe. I made it for spanish class yesterday and at first I thought I messed up but as the juices flowed together, it looked yummier and yummier. I ate some for dinner tonight and I loved it. It had an interesting taste which I loved. Thank you for posting this! Erica!!! 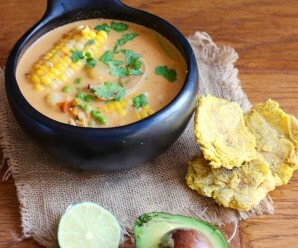 Gracias por esta maravillosa y facil receta… ademas Colombiana!!!! Wow… espero que me quede bien preparada… luego les contare!!! This is so fantastic, it’s a little out of control. I could eat this EVERY DAY! 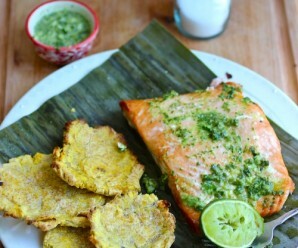 I served it with rice and beans, and avocado and mango slices on the side. I thought I died and went to heaven!! 😀 Thanks!!! 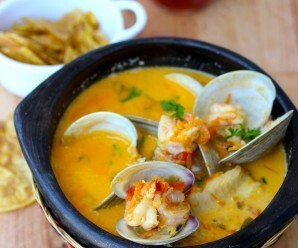 i am curious, why would you boil the shirmp in plain water instead of cooking them in the yummy sauce? 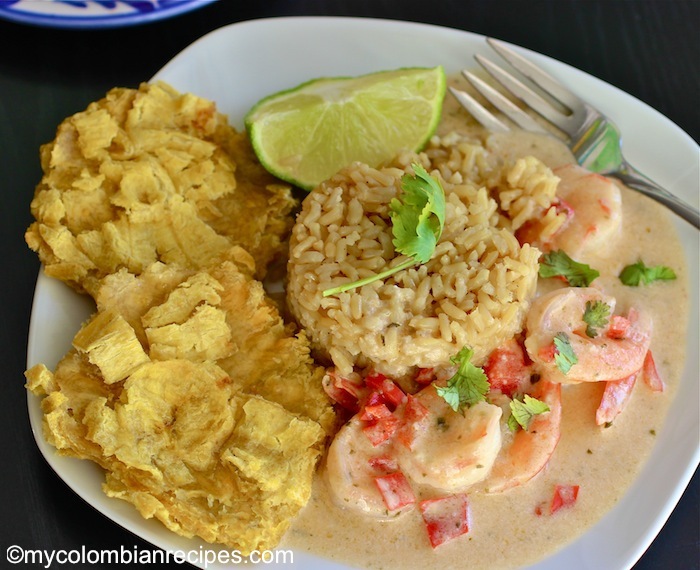 Because shrimp only need a very short cooking period otherwise they go tough. One, therefore, cooks them at a very high temperature for a very short period. 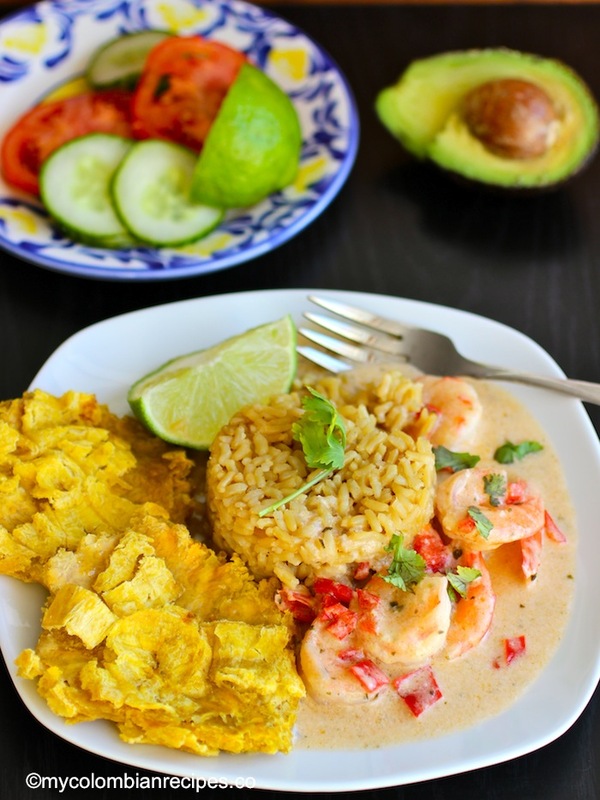 Subsequently, once the rest of the ingredients are cooked the shrimp are tossed in at lower temperature for short while just to reheat them and allow them to absorb the other flavours.